Studio Medics - The TV and Film Industries Specialist Medical Company ! Studio Medics offers staff for covering Film and TV sets in Studios across the UK, we can also supply medics for location filming or for your events. In addition at Elstree Film Studios where we have a base - we operate an on-site licenced medical room ensuring some of the best Film set medical facilities around. 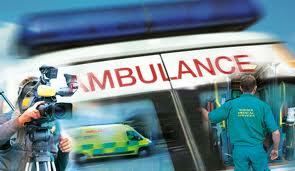 Medical Response vehicles - Cars, Mountain bikes, Motorcycles and Ambulances. Full range of equipment including - Medical Tent, all equipment as you would find on Frontline and Bariatric Emergency Ambulances - as used by the NHS. We can provide vehicles and staff as props / extras as well as Full Medical Support. Our sister division EMT provide Frontline cover to the NHS and Private Healthcare providers - specialising in Emergency Frontline, HDU, Paediatric and Bariatric Medicine. - All staff and equipment is used on NHS work so you can guarantee the authentisity. Do you require cover for 1 day or 1 year we can quote for all periods, we aim to provide consistancy of medical cover where possible to help build a long term partnership with you. Studio Medics is a trading name of Emergency Medical Transfers Ltd. EMT are fully registered with the Care Quality Commission ensuring our services comply to Government standards or above. All staff include office based are CRB enhanced checked, with all staff having to undertake regular compulsory training to ensure any advances in medicine and first aid is adopted and introduced promptly. We have a full range of staff available from Ambulance FPOS, ECA, Emergency Medical Technicians, Paramedics, HCA and Nurses to ensure the right staff member is available to meet your needs. Please contact to discuss details of previous assignments. Our Instructors and Medics are experienced, fun to work with, and completely professional. Our facility features state-of-the-art equipment, excellent training and consultation services, and we are available 24 hours a day 7 days a week. We hope to be able to help you soon!